DON NORMAN has been a database programmer, a newspaper reporter, an evangelical minister, a shoe salesman, a leather tanner, a DJ, and a high school history teacher. He continues to be a father and grandfather. He likes to arrange words in curious patterns and take pictures of dancing people. He is also deeply in love with a bunch of people. This essay is part of our month exploring the theme of Aging. Follow along with us all June for more stories on the theme. Learn more about Don and his work with LA Dance Collective in this story on free-form dance and forgiveness. I am 53 years old; a father of three and grandfather of two; and it is the grandfather bit that has forced me, more than anything, to confront my feelings and thoughts about aging. I WANT TO EMBRACE AGING, BUT HERE IS A REAL OPPORTUNITY AND I HAVE BEEN IN FULL ON COGNITIVE AVOIDANCE. 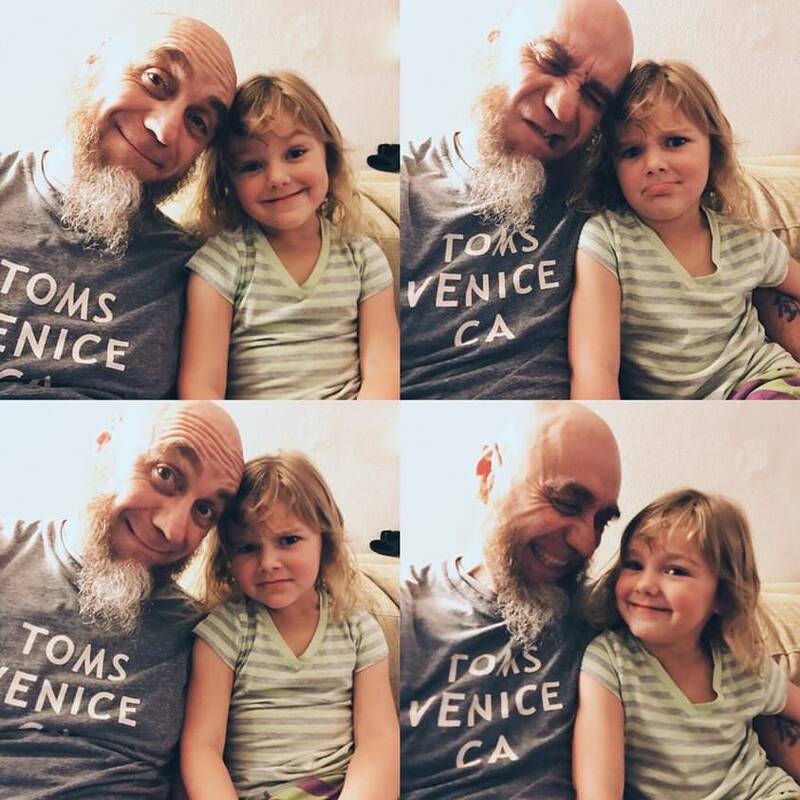 “My son had a daughter,” I used to say; or, “I am going to visit my son’s children.” My avoidance hasn’t worked well, as each person on whom I tried my slight of speech feels the need to say, “Oh, you’re a grandfather then!” and I nod and smile and cringe. I feel so uncomfortable with that simple word. I also feel uncomfortable with my discomfort. I tend to think I am much too young to be called a grandfather but I am delighted at the relationship and gratified to be at this stage in my life. I want to embrace aging, but here is a real opportunity and I have been in full on cognitive avoidance. When we say someone is “aging,” we usually mean they are getting old. The word conjures images of canes and walkers, age spots, wrinkles, complaints about ailments, stacks of pills, white hair, slowness, pain, and decay. We also tend to associate the loss of physical mobility with a loss of mental and emotional flexibility. I expect my body to change over time, to ultimately lose the battle to retain strength and vitality, and this has indeed been the case thus far. I take better care of my body now than at any other point in my life, but I heal slower, creak more, go to the bathroom more often, and am less driven by testosterone than I was earlier in my life. Though unwelcome, these changes fit into the standard narrative of “aging” But this inevitable decay of my physical body is contrasted with the flowering of the non-physical parts of myself. My intuition, emotions and thinking, the essential conscious aspects of what I think of as “me” are not decaying at all, they are growing and expanding. AGING MEANT LESS INSECURITY ABOUT THE WAYS IN WHICH I DEFINED MYSELF, AND THUS GREATER FLEXIBILITY TO CHANGE. In my twenties, I joined an actively evangelical church and began working in ministry. I also married and spawned three children with my then wife. I focused on raising my children and supplying for my family. I adopted a fairly rigid, conservative view of life and the world that reflected my upbringing, my adopted beliefs, and a need to find a solid way to define myself after a turbulent adolescence. It is fair to say that I was intolerant on issues regarding gender, sexuality and religious preference; and blind when it came to issues of race. I was charging forward in my career as a database administrator and programmer, where I was finding great success. As my twenties progressed into my thirties, and then into my forties, I was confronted with the ways in which my rigid views hurt and alienated the people around me, especially my children. Their teenage years required a tremendous amount of soul searching on my part as I recognized that their concerns about fairness, compassion and freedom of choice conflicted with my views. The flexibility to allow my children to challenge my thinking, and to change in response to what I learned was only possible because of the maturing effect of the years. Aging meant less insecurity about the ways in which I defined myself, and thus greater flexibility to change. The need to succeed was also tempered by my family’s needs as I came to see that my success, which had me flying all over the country, was costing me the close relationships I wanted in my family. Again, the aging process gave me the trust in my skills to and in my intrinsic worth to alter my career trajectory and prioritize the relationships that were most important to me. We have words for the progress of consciousness; words like “maturity,” “experience” and “wisdom”; terms of addition, not of subtraction. My eyes may weaken, but kindness grows. My hair recedes, but my capacity for compassion expands. My joints wear away, but my ability to hold the complexity of another human being is bolstered. There is, then, this surprising dichotomy in the march of time: I feel more capable, more flexible, and stronger as a person as my body weakens and loses vigor. This is the essential dissonance with the connotations of our language around aging. The language is focused on loss, but the experience includes both loss and gain, and the gains seem so much greater than the losses. In the balance sheet of life, I find aging to be ultimately profitable, and by a wide margin. MY EYES MAY WEAKEN, BUT KINDNESS GROWS. MY HAIR RECEDES, BUT MY CAPACITY FOR COMPASSION EXPANDS. I don’t feel old. I am still haunted by the child I was, still exploring the impact of my parent’s gifts and failings; I still carry profound feelings over things I experienced when I was five and fifteen and twenty-five and forty-five. I am a single person that encompasses all those experiences, and though I am contained in this aging body; within, I am all the ages I have experienced; I am all the hopes and dreams I have had and still have; I am all the doubts and shames and fears I have carried over the years. Inwardly, I am unbound by time. Holding my own babies and grand-babies has not freed me from the desire to be held in that same way. I have begun to confront my discomfort with aging through several means. One way is through a series of self-portraits which explore my relationship to myself and my body. Seeing myself, as I am physically, has forced me to confront the decay of my body, and to move closer to acceptance and even celebration of this body which is not all of who I am, but also not separate from who I am and who I am becoming. Writing into this missive on aging has also brought me face-to-face with my discomfort with “aging”. What I am finding is that it’s not the process that I am avoiding, it is the standard script about what aging means that I am intent on defying. For my 50th birthday, I left my job as a database developer, sold my house, and moved to California from New Hampshire. My life today includes volunteering with the contemporary dance company, Jacob Jonas The Company by managing their social media; facilitating ecstatic dance events with the LA Dance Collective; dance, photography and poetry. None of these pursuits is a money earner. For money, I drive for Lyft (this means I traded a six-figure income for an income in the low five-figure range). Such a radical departure probably screams “mid-life crisis”—at least that is what the standard aging script calls it when men make sweeping changes. Certainly, “mid-life change” is accurate, but there is no crisis. It has been a conscious choice to engage in life from a more deeply personal space; a choice that does not feed my 401K or a comfortable, safe picture of aging. Consciously, I am more open on issues of race, gender, sexuality, and politics. I engage with communities where prejudice is unwelcome and actively seek opportunities to address my own habits of thought regarding the varieties of ways in which people live. I recognize elements of masculinity and femininity in myself as subjects of wonder and curiosity rather than fear. I live in a part of Los Angeles that forces me on a daily basis to confront old attitudes toward the meaning of skin color. Internally, I am becoming more flexible in my opinions and attitudes, while the standard thinking on aging would suggest that I should be less comfortable with change, more calcified in my thinking, and unwilling to consider new ways of operating. A PART OF THIS JOURNEY OF GROWING OLDER IS THE EXPLORATION AND ADJUSTMENT OF MY ATTITUDES TOWARD DEATH AND MY WILLINGNESS TO ACCEPT, EVEN EMBRACE, THE UNKNOWN. Death is the big elephant in the room when we talk about aging, the inevitable mystery of what happens when the body dies. The contrast between external decay and internal expansion is, I think, part of the answer to the human tendency to believe in the continuation of the individual after the death of the body; how could this inverse relationship between the internal and external end when the body dies? Physical death is the obvious momentum of the decay of the body, but the momentum of my consciousness is moving in the opposite direction, so how could the end of consciousness be the result? Religion and spirituality are efforts to examine and contain our discomfort with the mystery of death, and aging is the growing shadow of death, the harbinger of endings. A part of this journey of growing older is the exploration and adjustment of my attitudes toward death and my willingness to accept, even embrace, the unknown. This embrace of death may be the ultimate flexibility. I want to face growing old with dignity, energy, honesty, and a healthy dose of rebellion. I want to approach aging as a craftsman approaches a potential masterpiece; to make the process, as far as I am able, something beautiful.